Start with one med. storage box and one large storage box, duct taped together. Spray painted the top and bottom. Cut out three sides of the top box and glue on clear vinyl to the openings. Wire two kitchen tongs together for the ‘claw’.Attach handles to the inside of the large box, for carrying. 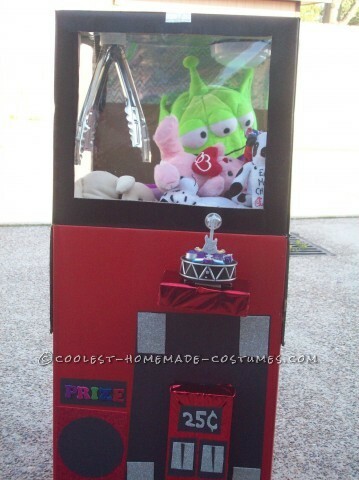 Decorate the outside to look like a real claw machine. Add stuffed animals or prizes to the inside. 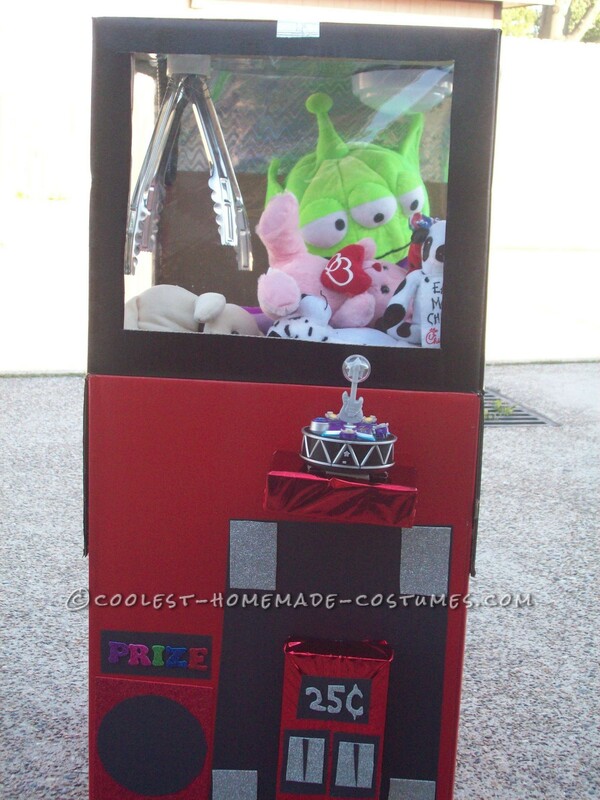 My daughter was dressed as one of the prizes, she is the green alien inside. I used a lot of glue and duct tape. We got the idea for this costume because my daughter plays the claw machines A LOT when we are at the stores that have them. She wins a lot, she donates most of them to our locale police dept., who in turn gives them to children on domestic calls. so, one day I said to my daughter, you play these machines so much, you should be one for Halloween. The reaction from others was great!!! She won first place in three local contest. A lot of people took pictures and thought that it was a real machine, children and adults!! In our household, Halloween is a big deal every year. I make my daughters costume every year. This is something that we do together and enjoy from start to finish. We look forward to the next Halloween.